Actually, anyone who knows and appreciates the humor of David Sedaris also knows there is nothing typical about him, man or not. Born in New York of Greek heritage but raised in the Bible Belt of Raleigh, NC, he was destined to be "something other." He delivers his sarcastic yet hilarious observations about everyday life with a Manhattan edge softened by a decidedly Southern kindness. Somehow he manages to be crass and nice all at the same time. As a testament to his genuine niceness, Mr. Sedaris recognized by name two young people in the audience, Grace Anne and Ford. He even departed from his usual routine to read a story just for them. All around me, the audience speculated aloud, "Ford and Grace Anne? Who are they?" as if they were secret celebrities among us. Only a few of us knew them, because they and their family are friends of ours. 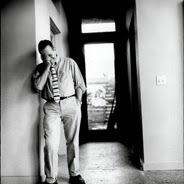 (Move over, Kevin Bacon - there is only one degree of separation between me and David Sedaris.) Their mother, Kerry, is a friend of David's and had brought them to meet him for the first time. That meant so much to him that he brought them gifts and singled them out in his show before a sold out audience. Now that's nice. And pretty funny. I'm not sure he would describe himself as "funny" - that smacks of someone who tries too hard or resorts to clowning - but last night he had a capacity audience at the Charleston Music Hall in stitches. His writing is tight, well crafted, conversational. His stories are poignant, full of observations the average person might never make, or might make but never, ever verbalize. And his delivery and ability to hold an audience in his palm is amazing for a man who, as a boy, would rather make chicken cacciatore alone in his mother's kitchen than play softball at school. I have listened to Mr. Sedaris on NPR and have read his stories, but this was the first time I was able to attend one of his concerts. My cousin Dawn introduced me to his humor years ago in the form of the SantaLand Diaries, so it was only natural that I would share this night of humor with her. As a writer, it was fascinating for me to watch him read his stories aloud, pencil in hand. It was daunting, too: if I became a successful writer, would I be able to read my own stories aloud? to engage a live audience? to entertain in public as well as write in private? And, I thought, could I ever be that transparent, could I ever write uncensored or stop worrying about what other people might think? During the audience Q&A, someone asked what he was doing with his pencil while reading a yet unpublished story. His answer was one every writer knew and understood. He was editing and making notes as he went, molding the story as he read it, making it tighter, noting what the audience thought was funny, what they didn't. He explained that once a story was published in a book, it was set, but until that point he was constantly changing it, improving it, making it say exactly what he meant and not just a close approximation, making it something he would enjoy reading himself and hopefully not make him cringe when reading it a few years from now. "Well, I'm not exactly my biggest fan." He made a passing mention of his latest article, published in The New Yorker, but never mentioned that his sister Tiffany had recently committed suicide. He segued to promote a book written by an author whom he has never met, just because he liked it, thought it was worth reading, and thought we might learn something from it. Then he made his way to the lobby to sign books for the hundreds of people who had come to his concert and were anxious to meet him. I would have loved to have his autograph in his new book, but I needed to say goodbye to my friends and get home to my family. As I passed his table, Mr. Sedaris removed his smashing blue velvet sports coat, hung it carefully over the back of his chair, and turned his honest attention to the first person in line. When I exited the parking garage nearly 40 minutes later and drove by the lobby, he was still signing. Now that's a nice guy.